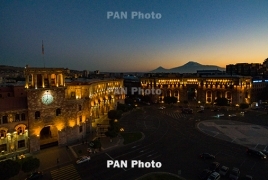 PanARMENIAN.Net - Delicious food, folk motifs, ancient architecture: Armenia attracts more and more tourists, Mir24 says in a fresh article, adding that those who have ever visited Yerevan, believe that the city is especially beautiful at night. “Yerevan almost never sleeps. Guests of the city go to Northern Avenue - which is also called the local Broadway. Here you can meet performers of folk tunes and those who play the latest hits. The Northern Avenue is a venue for all creative personalities out there. This place hosts concerts, festivals and fairs, while artists hold paint shows throughout the night and draw portraits of passers-by,” the article says. The publication also recommends visiting the Republic Square in downtown Yerevan, which is especially beautiful at night. The Republic Square is almost a hundred years old. All the buildings there are built from pink tuff, that’s why Yerevan is also called the "pink city". Both tourists and specialists appreciate the special style and national motives in architecture. The article also says that Cafesjian Center for the Arts - an open-air venue - is always ready to host travelers. Besides outdoor activities, tourists are also interested in eating in the Armenian capital. Gourmets make lists of cafes, bars and restaurants that they are planning to visit. Many are located in buildings associated with famous personalities. You can simultaneously eat and study the history of Yerevan. "There are a few dozens of attractions in the Armenian capital, for which tourists travel thousands of kilometers. Tour operators have calculated: one day of a rich cultural program with accommodation and meals costs no more than $70. In the first half of the year, Armenia's economic grew by 9%, "-the article says.